There are many things you have to try when skiing in Val di Fassa in the Italian Dolomites. First and foremost: on the mountain, limber up and complete the Sella Ronda tour, 26km of blue and red runs that links four valleys, taking you past the villages of Arabba, Canazei, Selva and Corvara on one liftpass. You can do the tour in both directions and while the terrain isn’t the most demanding in the world, it’s a great way for intermediate skiers to see the whole area. Second: when you fancy an 11am break from skiing, ditch the cappuccino and opt for Bombardino, an eggy rum drink that will fire you up for the rest of the morning. When you’ve acquired a taste for that, you must then learn to love polenta: it’s served almost as often as pasta in traditional dishes from the Trentino region. Then, just as dusk is falling at the end of your ski day, find a good viewing point and enjoy the Enrosadira, a beautiful pink glow that bathes the limestone and coral rock of the Dolimiti. Local mythology has it that a colourful spell was cast on the mountains to please a princess: geologists say the calcareous nature of the pale rock is what causes the reddish glow at sunrise and sunset. Either way, coupled with the jagged formation of the rocks, the Enrosadira sets the Dolimites apart from the Alps and rewards us with some of the most stunning scenery in Europe. The Dolomites have recently been named a Unesco World Natural Heritage site and as you’re skiing around, you will be stunned by the imposing Catinaccio, Sassolungo, Sella Massif and Marmolada giants. That’s before you’ve even noticed the 80 or so 3,000m peaks in the distance. When you have ticked all these boxes, all that remains is to soak up the substantial culture and history of this region. The Dolomites, named after a French geologist, include well-known resorts like Madonna di Campiglio and Cortina and boast a total of 1,200 skiable kilometres in 12 ski areas, 475km of which are directly linked. A gateway between the Mediterranean and central Europe, the region’s culture is ancient and rich. Val di Fassa is the cradle of Ladin, the native language which dates back to the Roman Empire and is officially recognised and spoken on a daily basis. Val di Fassa is where tourism began in the area, before WW1. The history is equally interesting: World War 1 soldiers fought in the mountains here, building a network of tunnels to sleep in and triggering avalanches to kill the enemy. Along with the Sella Ronda, you can undertake a ‘Great War ski tour’ here or visit a WW1 museum in the mountains. 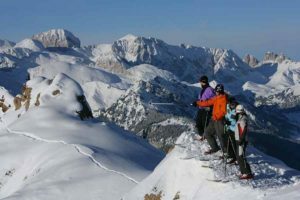 As the Sella Ronda tour indicates, skiing in the Dolomites is pitched at intermediate level, although more advanced skiers will enjoy steeper stuff at Arabba and on the 3,400m Marmolada glacier. Ski touring is also popular – each March, some of the world’s top ski tourers compete to win the Sella Ronda Ski Marathon, a race that’s run at night. Accommodation in the area is mainly three to four star. You could choose the small resort of Moena as your gateway to the Sella Ronda tour. If you fancy a more exclusive break in the heart of the mountains, opt for Hotel Capella at Colfosco, which is tucked away on the slopes. Val di Fassa is a place that takes its sommeliers as seriously as its ski terrain. As much as they enjoy skiing, Italians like to savour the Tyrolean gastronomy and wines of the region. Signs bearing the words ‘Osteria Tipica Trentino’ tell you to expect traditional dishes. Savour delicacies like deer carpaccio with apple salad or liver and polenta (tastes far better than it sounds) in excellent restaurants like the Valbona and Fuciade mountain lodges. If you still have cash to splash, dine at Malga Panna, a one star Michelin restaurant near Moena. Exceptional scenery. Try to get to Saas Pordoi, the so-called ‘Terrace of the Dolomites’, reached from the Saas Pordoi cable car, lovely views of the Enrosadira at an altitude of 2,950m. Quiet slopes in off-peak weeks. Excellent Tyrolean food, if you can just learn to love polenta dammit! Culture and history if you’re over 50 and still think WW1 is fascinating. Regular, reasonably-priced shuttles to major airports from Trentino. Being force-fed eggy rum drinks at eleven in the morning when all you really want is a steaming hot coffee. Getting on and off countless lifts on the Sella Ronda tour. They don’t call it a ‘merry-go-round’ for no reason. The route is busy in January so god only knows what it’s like in peak season. Too many intermediate skiers on one mountain is not a good thing. You may find livelier nightlife in Mullingar on a Tuesday night.